303 Commonwealth is located on the north side of Commonwealth, between Gloucester and Hereford, with 297 Commonwealth to the east and 305 Commonwealth to the west. 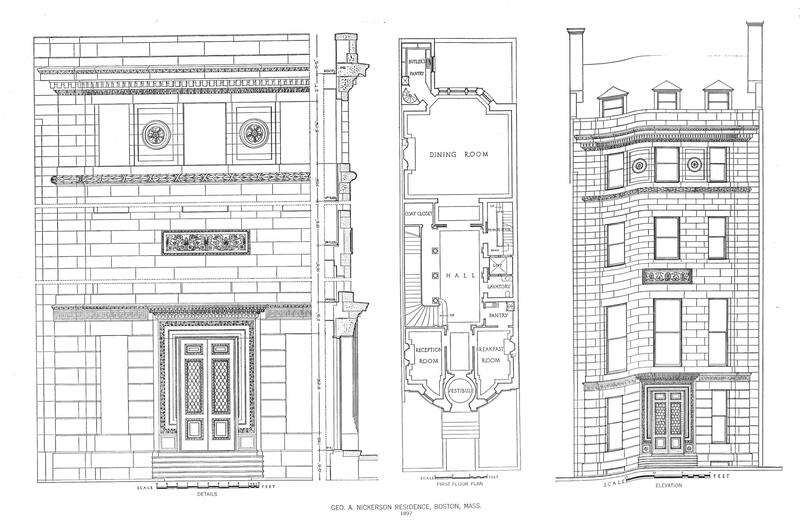 303 Commonwealth was designed by McKim, Mead, and White, architects, and built in 1895-1896 (the builder is not identified on the original building permit application) as the home of George Augustus Nickerson and his wife, Ellen Floyd (Touzalin) Nickerson. He is shown as the owner on the original building permit application, dated June 29, 1895. The land for 303 Commonwealth was the western 33 feet of a 78 foot wide lot George Nickerson purchased on January 19, 1895, from Gordon Dexter. 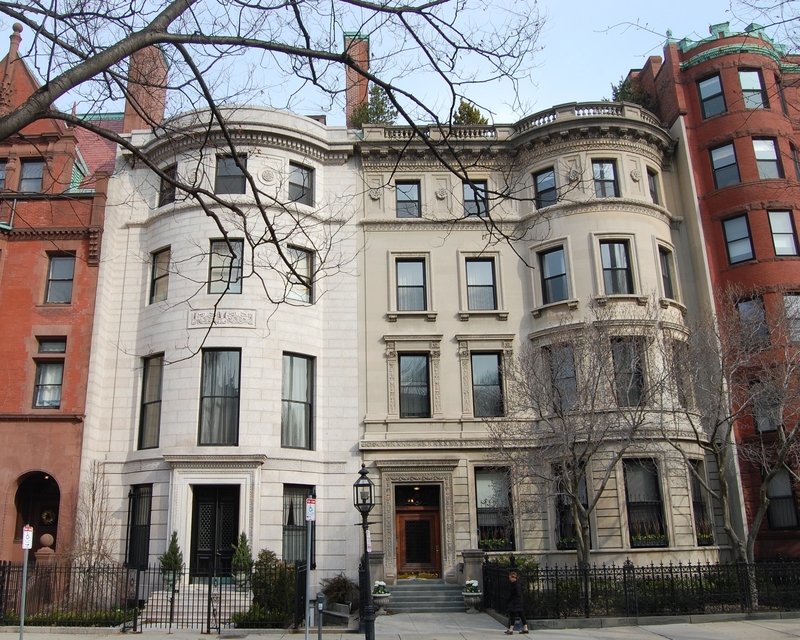 On May 16, 1899, George Nickerson sold the eastern 45 feet of the lot to Jessie Fremont (Preston) Draper, the wife of George Albert Draper, and the Drapers built their home at 297 Commonwealth on it. In the deed, George Nickerson specified that only a single-family dwelling could be built at 297 Commonwealth and that no bay or bow could be built within ten feet of their house at 303 Commonwealth. 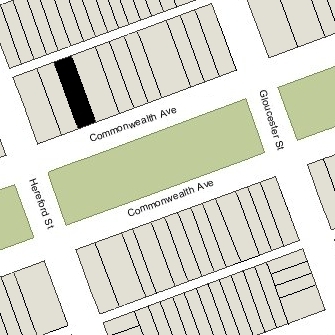 The land where 303 Commonwealth and 297 Commonwealth were built previously had been part of a 185 foot parcel purchased by building contractor George Wheatland, Jr., on May 10, 1872, from a real estate investment trust formed by Grenville Temple Winthrop Braman, Henry Dwight Hyde, and Frank William Andrews. It was part of one of four tracts of land purchased by the trust on March 1, 1872, from the Boston Water Power Company. Click here for an index to the deeds for 303 Commonwealth. The 1872 deed to George Wheatland, Jr., included the standard building restrictions contained in most of the deeds for land in the Back Bay. Those restrictions required, among other things, that the front of the building be set back 20 feet from Commonwealth and that any bay, circular front, or octagon front that extended into this setback area be no more than 70 percent of the width of the building and, under any circumstance, be no more than 18 feet in width. 303 Commonwealth does not conform with these requirements. However, unlike other cases (such as at 16 Marlborough), the abutting neighbors apparently did not object and the house was permitted to remain as built. By the 1896-1897 winter season, George and Ellen Nickerson had made 303 Commonwealth their home. They had lived at 183 Commonwealth during the 1893-1894 season. They also maintained a home in Dedham. George Nickerson was president of the Arlington Mills, textile manufacturers. He died in September of 1901, and during the 1901-1902 winter season, 303 Commonwealth was temporarily the home of Dr. Charles Goddard Weld, a surgeon, and his wife, Hannah Putnam (Train) Weld. They had lived in an apartment at 333 Commonwealth in April of 1901, when their daughter, Mary, was born. By the 1902-1903 winter season, the Welds had moved to 190 Commonwealth and 303 Commonwealth was once again the home of Ellen Nickerson. She continued to live there during the 1903-1904 season, but moved thereafter, probably making Dedham her year-round residence. By the 1904-1905 winter season, 303 Commonwealth was the home of Mary Ward (Lyon) Cheney, the widow of Charles Paine Cheney. She continued to live there until her marriage, in September of 1907, to William Henry Schofield, a professor of English and head of the Department of Comparative Literature at Harvard. He also taught Old Norse and Norwegian and was a pioneer of Scandinavian studies at Harvard. On April 15, 1907, 303 Commonwealth was acquired from Ellen Nickerson by Gertrude Stewart (Fabyan) Thomas, the wife of cotton merchant Isaac Rand Thomas. They previously had lived at 134 Marlborough. They also maintained a home, Moonstone Farm, in Ipswich. Isaac and Gertrude Thomas continued to live at 303 Commonwealth until about 1924, when they made Ipswich their year-round home. They continued to own 303 Commonwealth and lease it to others. 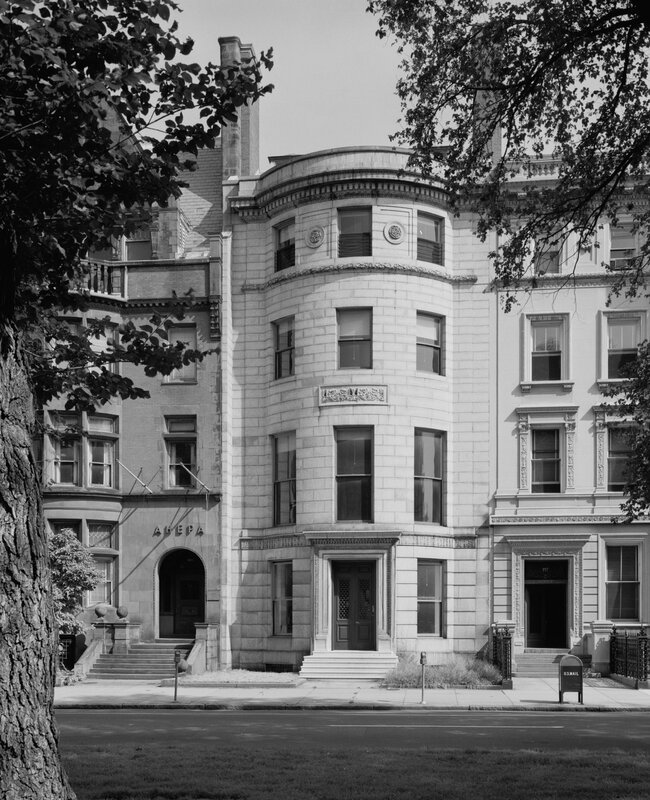 By the 1924-1925 winter season, 303 Commonwealth was the home of Edward Pierson Beebe. He had lived at 261 Marlborough during the previous season. He also maintained a home, Highfield Hall, in Falmouth. He continued to live at 303 Commonwealth until his death in August of 1926. 303 Commonwealth was not listed in the 1927 Blue Book. 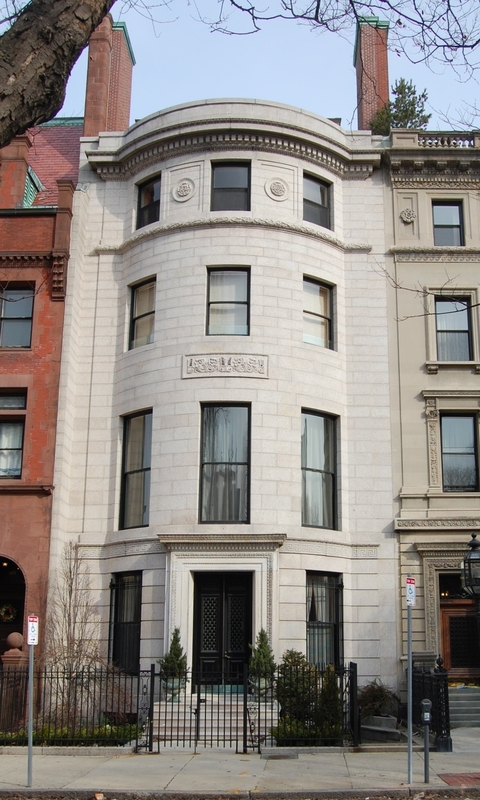 During the 1927-1928 winter season, 303 Commonwealth was the home of Bayard Warren and his wife, Elizabeth (Sears) Warren. They also maintained a home in Prides Crossing. By the next season, they had moved to an apartment at 301 Berkeley. 303 Commonwealth was not listed in the 1929-1931 Blue Books and was shown as vacant in the 1930-1931 City Directories. On April 10, 1931, 303 Commonwealth was purchased from Gertrude Thomas by attorney Dudley Leavitt Pickman, Jr. He and his wife, Vivian Hervey (Wessell) Cochrane Pickman, made it their home. They had married in November of 1930 (she was the widow of Alexander Lynde Cochrane, who had died in January of 1928) and had lived briefly at 127 Beacon in 1931. Prior to her first marriage, she had been a stage actress. They also maintained a home in Cohasset and later in Beverly. Vivian Pickman’s children by her first marriage — Alexander Cochrane, Lucy Douglas Cochrane, Nancy Cochrane, and Jean Cochrane — lived with them. Lucy Cochrane later became an actress and author under the name C. Z. Guest. Dudley and Vivian Pickman continued to live at 303 Commonwealth until their deaths, he in April of 1964, and she in October of 1965. In December of 1966, Ellen Pickman’s estate filed for permission to convert the property from a single-family dwelling into a single-family dwelling and funeral parlor. The application was subsequently abandoned. On June 14, 1967, 303 Commonwealth was purchased from Ellen Pickman’s estate by Portia Law School (predecessor to the New England School of Law). In September of 1967, the Calvin Coolidge College (the undergraduate affiliate of Portia Law School) filed for permission to convert the property from a single-family dwelling into classrooms for adults. The proposal was strongly opposed by neighborhood residents and in December of 1967, the zoning Board of Appeal voted not to allow the use. On June 18, 1968, 303 Commonwealth was acquired from Portia Law School by Myrna (Steinowitz) Esser, the wife of Kurt Esser, a tax attorney with the Gillette Company. They previously had lived at 230 Marlborough. 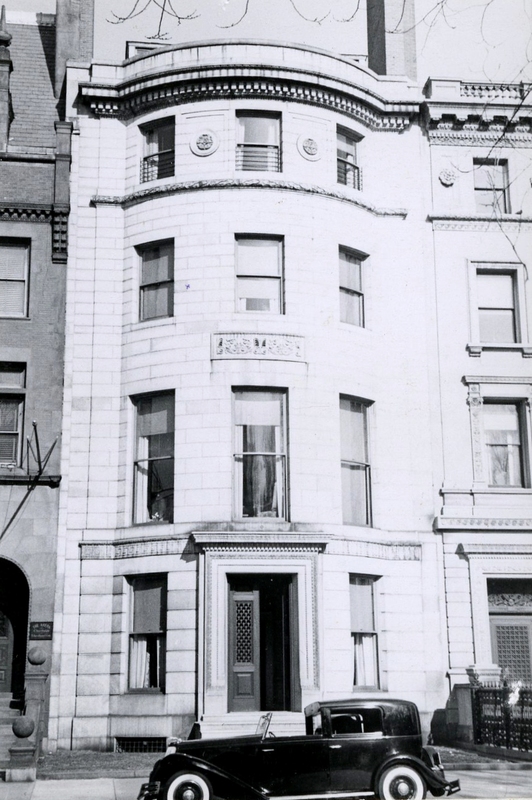 In July of 1968, Myrna Esser filed for (and subsequently received) permission to convert the property into five apartments, one of which became their home. On October 5, 1977, Myrna Esser converted the property into five condominium units, the 303 Commonwealth Condominium.